Part of feeling financially secure is knowing the PIN you pick for your debit or credit card cannot easily be retrieved. Still, some people will randomly pick a PIN and write it on the back of their card thinking it does not matter, when, in actuality, they are defeating the whole purpose of having a PIN in the first place. Think about the ramifications of writing your PIN in small print on the back of your debit or credit card. What if your card is lost or stolen? By writing your PIN on the back of your card, you provide an easy way for a thief or anyone to gain access to your money. Therefore, it is important to find a way to remember your PIN and still make it hard for others to obtain. Writing down your PIN anywhere is not really the best approach. Instead, it would be better to find a way to remember your PIN numbers so no one is able to gain access to them. 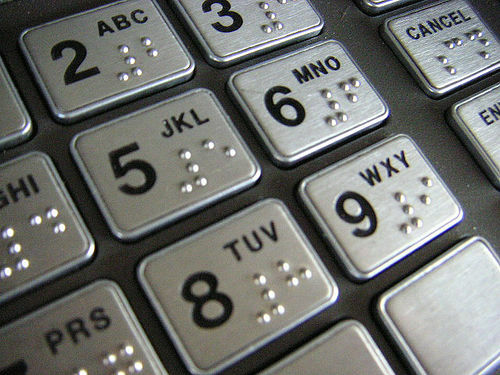 One way of creating a memorable PIN is by thinking of an associative word and correlating the letters of the word with the related numbers on the phone pad. For instance, you might want to use the word “Save” for a savings account; therefore, the corresponding numbers on the phone pad would be 7283. Or, you could use the word “Bank.” In this case, you’d choose the corresponding numbers of 2265. Therefore, if you forget your PIN, you only have to refer to your phone pad to retrieve the necessary information. For extra security, you might think of a word that is easy to remember but create a pin from the word spelled backwards. Therefore, for “Save,” you would create the PIN 3827 (or, “Save” spelled backwards from the phone pad). Although you might not want to use such obvious words, you will still want to make sure to pick words you soon will not forget. Other people like to use personal information, such as a birth date in order to create a PIN. Of course, you can run somewhat of a security risk by using this approach, especially if a good number of people have access to your personal information. Nevertheless, you might be able to steer around this problem by using, for instance, part of your birth date in combination with, say, your phone number. Whatever PIN you choose, it is important that you make it a number that can only be accessed one way, and that’s through your memory. Make sure you choose well-defined PINs to keep your accounts secure as they’re meant to be. I use the location of the keys on the standard keypad to remember PINs. It hasn’t let me down, but I once had to visualize a keypad in my head to retrieve it when I found a machine with the number order reversed. That was a bit of a PITA.